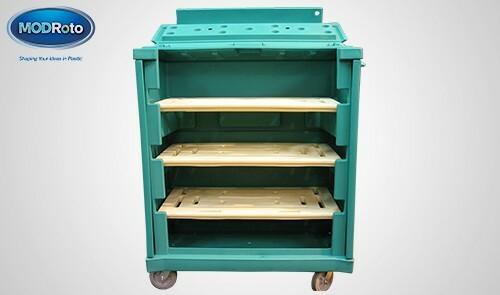 The MODRoto 90PL bulk linen cart comes with style, class and luxury appeal. 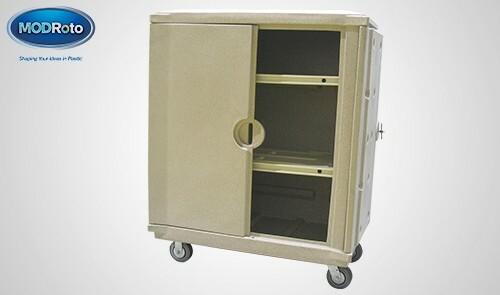 It is a high-capacity, attractive clean linen delivery truck designed for hotels, resorts, long-term care facilities and other properties where a premium is placed on visual appeal as well as on security, durability and longevity. 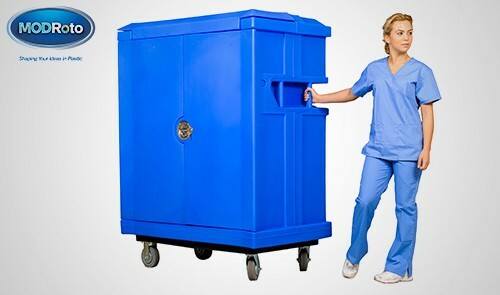 The 90PL linen cart comes with two, non-removable, horizontal shelves, each molded in a single piece of smooth polyethylene plastic, set in a weatherproof, all-plastic cart that doesn’t harbor bacteria and wipes clean. A solid, closed roof keeps linens clean, dry and secure. Lockable, rotomolded doors deter casual theft and swing open to a full 270 degrees to attach flush against the side of the cart with Velcro. Hallways stay clear and passable. The 90PL includes our powder-coated, full-perimeter, steel base as standard. Or choose our poly-steel base that encases smooth plastic with rounded corners around heavy-duty metal as an option. Available in 12 standard colors and custom colors in quantity. Recessed safety handle included as standard on one side and on both sides as an option.